Software Development Engineers are accountable for creating and implementing software systems for client companies. 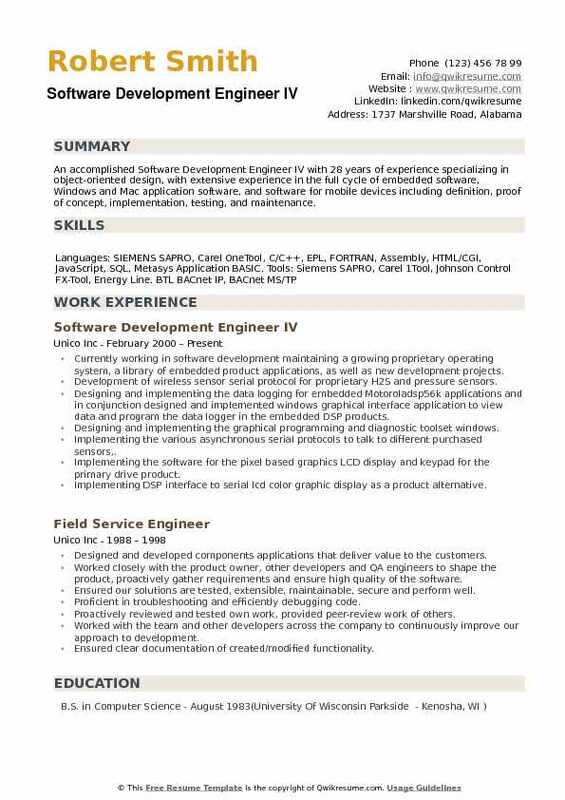 The duties typically listed in the resume of these engineers are – writing codes in various languages, executing full software development cycle, developing layouts and flowcharts, writing well-designed writable codes, integrating software components, developing software verification plans, testing applications, collaborating with development staff, troubleshooting and upgrading existing systems. 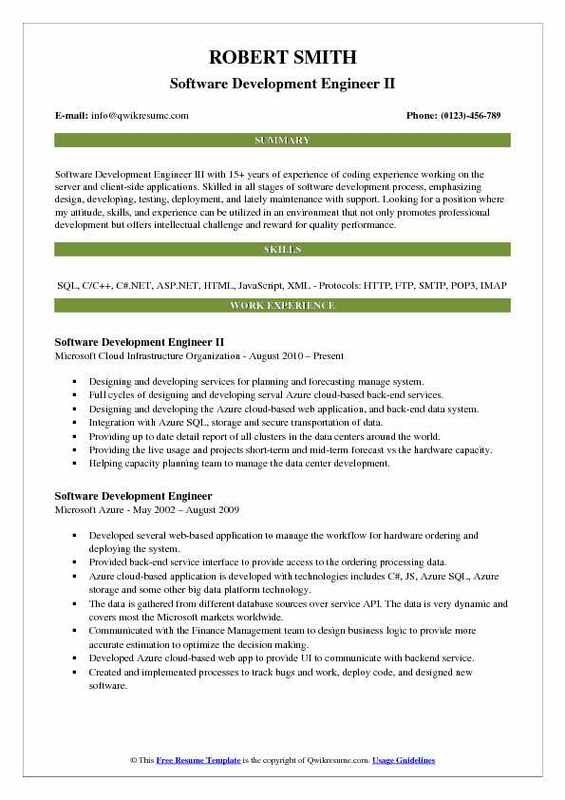 Software development engineer Resume should highlight on qualifications such as programming skills, experience in designing interactive applications, software developing abilities in Ruby on Rails, Java, C++; knowledge of relational database, proficiency in software tools, and experience in developing web applications on major frameworks. Eligible candidates display a degree in the field of software engineering or information technology. 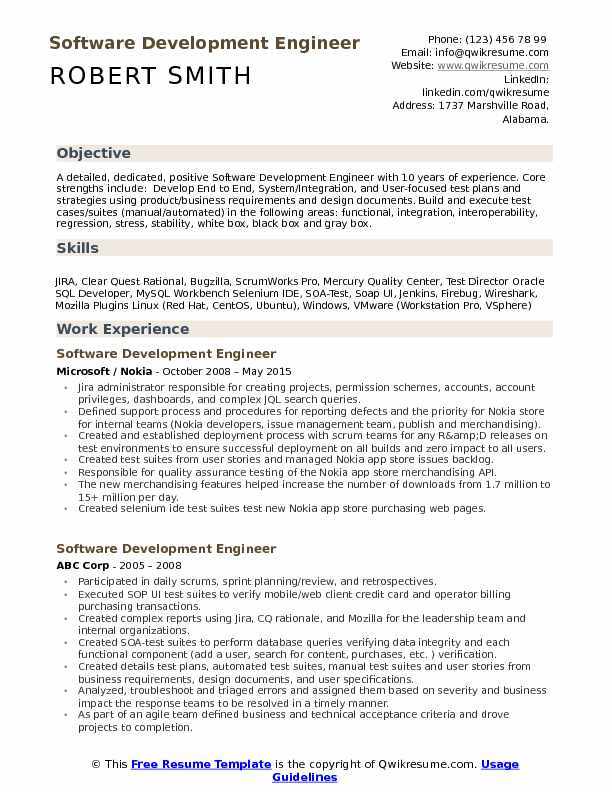 Summary : A detailed, dedicated, positive Software Development Engineer with 10 years of experience. Core strengths include: Develop End to End, System/Integration, and User-focused test plans and strategies using product/business requirements and design documents. Build and execute test cases/suites (manual/automated) in the following areas: functional, integration, interoperability, regression, stress, stability, white box, black box and gray box. Jira administrator responsible for creating projects, permission schemes, accounts, account privileges, dashboards, and complex JQL search queries. Defined support process and procedures for reporting defects and the priority for Nokia store for internal teams (Nokia developers, issue management team, publish and merchandising). Created and established deployment process with scrum teams for any R&D releases on test environments to ensure successful deployment on all builds and zero impact to all users. Created test suites from user stories and managed Nokia app store issues backlog. Responsible for quality assurance testing of the Nokia app store merchandising API. The new merchandising features helped increase the number of downloads from 1.7 million to 15+ million per day. Created selenium ide test suites test new Nokia app store purchasing web pages. 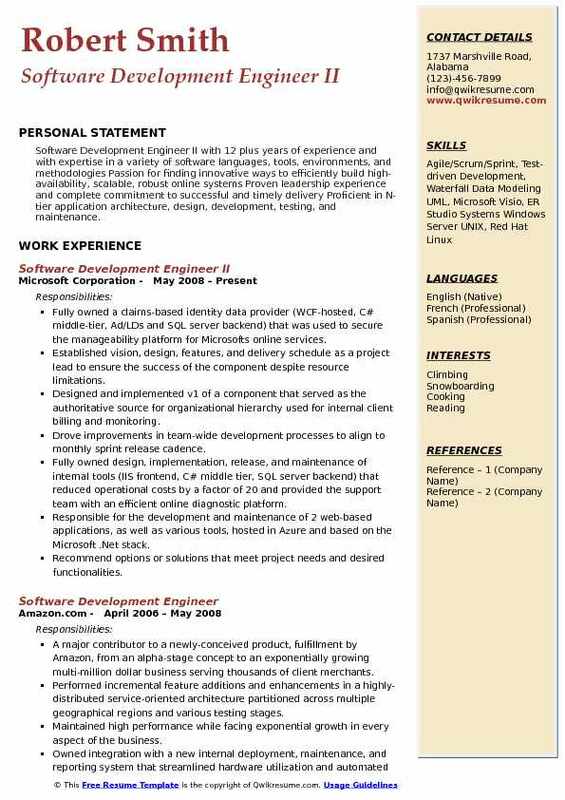 Summary : Highly motivated Senior Software Development Engineer with 11 years of experience with a track record of successfully delivering projects on or ahead of schedule. Possess exceptional communication skills that facilitate specialty of cross-functional standardization. Capable of streamlining development processes and increasing team sharing through strategic organizational analysis. Demonstrated leadership and innovation in designing quality system solutions. Selected by an internationally recognized leader in digital imaging, precision optics, photo imaging technology to develop and support image processing software for Nikon products. Drafted design documents, project schedules, researched and innovated new technologies to enhance user software experience. Coordinated and communicated with teams in both U.S. and Japan offices. Developed cross-platform code using C/C++, Boost, and internal libraries. Planned, coordinated and developed project to transition 32-bit software to 64-bit Mac and Windows platforms. Designed and developed next-generation image processing library modeled after OpenCL. Introduced and implemented cross-platform unit testing using Apple OCTest/XCTest, Google C++. Worked with infrastructure admin and team to proactively support the latest hardware, tools, and compilers for the internal auto-build system. Worked with both Apple and Intel engineers to profile, analyze and optimize Nikon image. 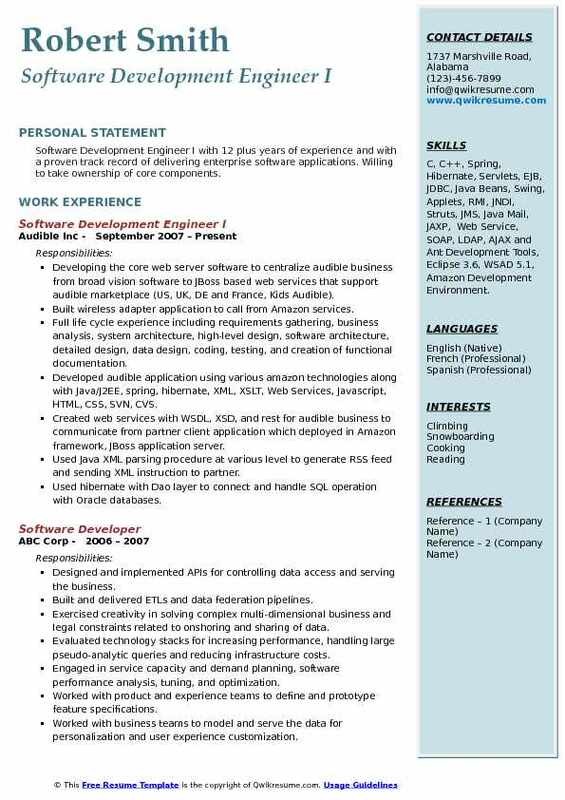 Summary : Software Development Engineer III with 15+ years of experience of coding experience working on the server and client-side applications. Skilled in all stages of software development process, emphasizing design, developing, testing, deployment, and lately maintenance with support. Looking for a position where my attitude, skills, and experience can be utilized in an environment that not only promotes professional development but offers intellectual challenge and reward for quality performance. Designing and developing services for planning and forecasting manage system. Full cycles of designing and developing serval Azure cloud-based back-end services. Designing and developing the Azure cloud-based web application, and back-end data system. Integration with Azure SQL, storage and secure transportation of data. Providing up to date detail report of all clusters in the data centers around the world. Providing the live usage and projects short-term and mid-term forecast vs the hardware capacity. Helping capacity planning team to manage the data center development. The data is pulled from a variety of sources, include data warehouse, other cloud services and sometimes the SQL table directly. This Azure cloud-based application developed with technologies includes C#, Azure SQL, ASP.Net MVC, Entity Framework, Cloud Storage and Azure security. 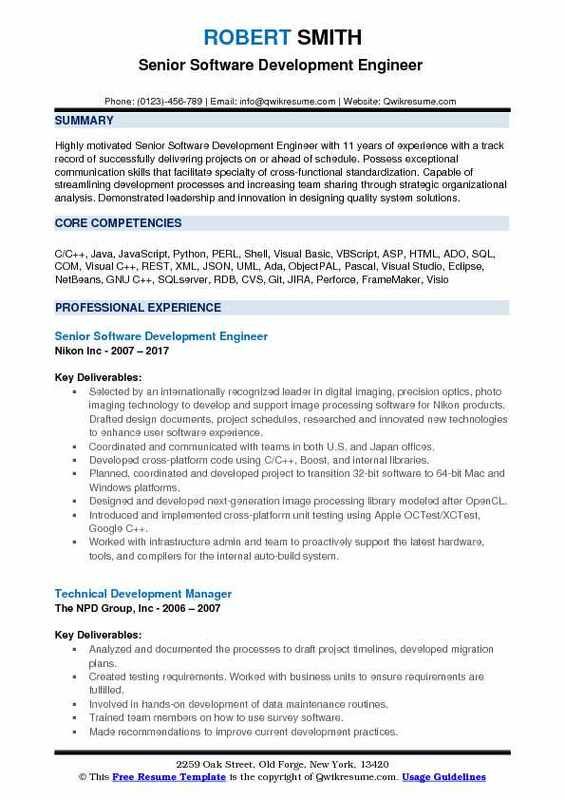 Objective : Junior Software Development Engineer with 4 plus years of experience in the Technology domain is looking forward for a challenging opportunity, will utilize my unique combination of technical, operations and release management experience that would allow me to contribute to the growth of an organization. Involved in designing, developing and architecting application in ASP.Net MVC 4 using C#, SQL server. Developing and consuming WCF services to achieve service-oriented architecture (SOA) and communication between heterogeneous applications. Designing rich user interface using HTML5/CSS3, responsive web design using bootstrap CSS. Developing various Linq data context object with ADO.Net entity framework for most of the dal operations. Responsible for support and development of SharePoint site and SharePoint 2013 components (web parts, application pages, page layouts, etc. ) for enterprise-scale portals and collaboration solutions. Well organized implementation of caching, session management techniques. Creating custom web forms with different views and permissions for edit and display using SharePoint designer and Visual Studio for custom validation and auto-population on fields. Created SharePoint hosted apps using client-side object models and jquery. 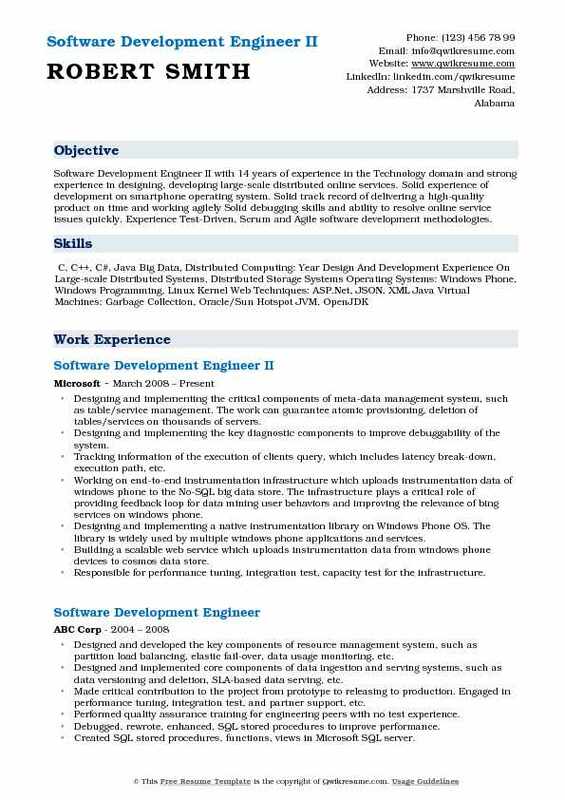 Summary : Software Development Engineer I with 12 plus years of experience and with a proven track record of delivering enterprise software applications. Willing to take ownership of core components. Skills : C, C++, Spring, Hibernate, Servlets, EJB, JDBC, Java Beans, Swing, Applets, RMI, JNDI, Struts, JMS, Java Mail, JAXP, Web Service, SOAP, LDAP, AJAX and Ant Development Tools, Eclipse 3.6, WSAD 5.1, Amazon Development Environment. Developing the core web server software to centralize audible business from broad vision software to JBoss based web services that support audible marketplace (US, UK, DE and France, Kids Audible). Built wireless adapter application to call from Amazon services. Full life cycle experience including requirements gathering, business analysis, system architecture, high-level design, software architecture, detailed design, data design, coding, testing, and creation of functional documentation. Created web services with WSDL, XSD, and rest for audible business to communicate from partner client application which deployed in Amazon framework, JBoss application server. Used Java XML parsing procedure at various level to generate RSS feed and sending XML instruction to partner. Used hibernate with Dao layer to connect and handle SQL operation with Oracle databases. Worked with audible kindle fulfillment, membership, and digital purchase pipeline. Created web application using JSP, a servlet for audible feed application. 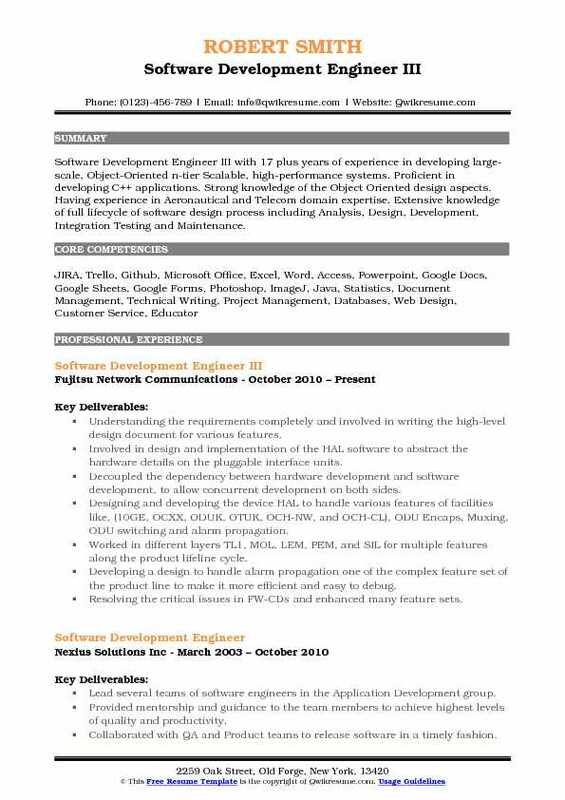 Summary : Software Development Engineer II with 14 years of experience in the Technology domain and strong experience in designing, developing large-scale distributed online services. Solid experience of development on smartphone operating system. Solid track record of delivering a high-quality product on time and working agilely Solid debugging skills and ability to resolve online service issues quickly. Experience Test-Driven, Scrum and Agile software development methodologies. Designing and implementing the critical components of meta-data management system, such as table/service management. The work can guarantee atomic provisioning, deletion of tables/services on thousands of servers. Designing and implementing the key diagnostic components to improve debuggability of the system. Tracking information of the execution of clients query, which includes latency break-down, execution path, etc. Working on end-to-end instrumentation infrastructure which uploads instrumentation data of windows phone to the No-SQL big data store. The infrastructure plays a critical role of providing feedback loop for data mining user behaviors and improving the relevance of bing services on windows phone. Designing and implementing a native instrumentation library on Windows Phone OS. The library is widely used by multiple windows phone applications and services. Building a scalable web service which uploads instrumentation data from windows phone devices to cosmos data store. Responsible for performance tuning, integration test, capacity test for the infrastructure. 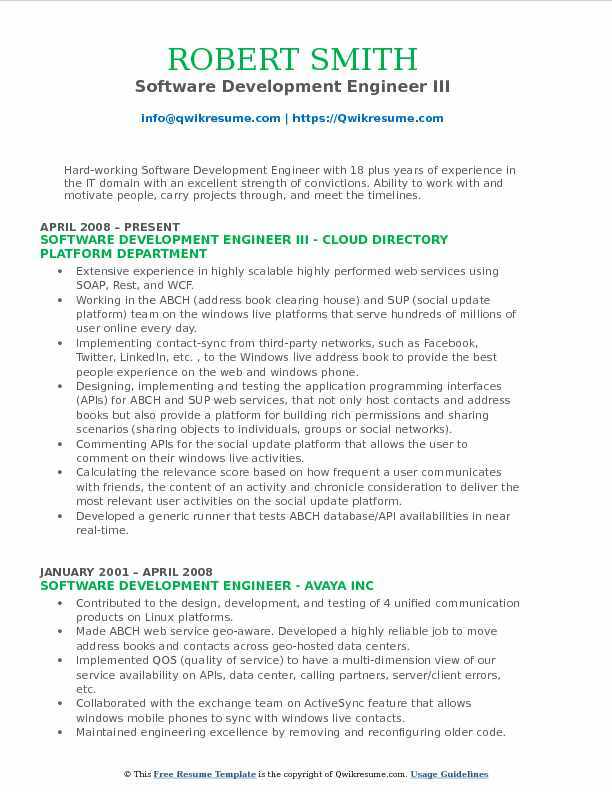 Summary : Hard-working Software Development Engineer with 18 plus years of experience in the IT domain with an excellent strength of convictions. Ability to work with and motivate people, carry projects through, and meet the timelines. Extensive experience in highly scalable highly performed web services using SOAP, Rest, and WCF. Working in the ABCH (address book clearing house) and SUP (social update platform) team on the windows live platforms that serve hundreds of millions of user online every day. Implementing contact-sync from third-party networks, such as Facebook, Twitter, LinkedIn, etc. , to the Windows live address book to provide the best people experience on the web and windows phone. Designing, implementing and testing the application programming interfaces (APIs) for ABCH and SUP web services, that not only host contacts and address books but also provide a platform for building rich permissions and sharing scenarios (sharing objects to individuals, groups or social networks). Commenting APIs for the social update platform that allows the user to comment on their windows live activities. Calculating the relevance score based on how frequent a user communicates with friends, the content of an activity and chronicle consideration to deliver the most relevant user activities on the social update platform. Developed a generic runner that tests ABCH database/API availabilities in near real-time. Summary : Software Development Engineer III with 17 plus years of experience in developing large-scale, Object-Oriented n-tier Scalable, high-performance systems. 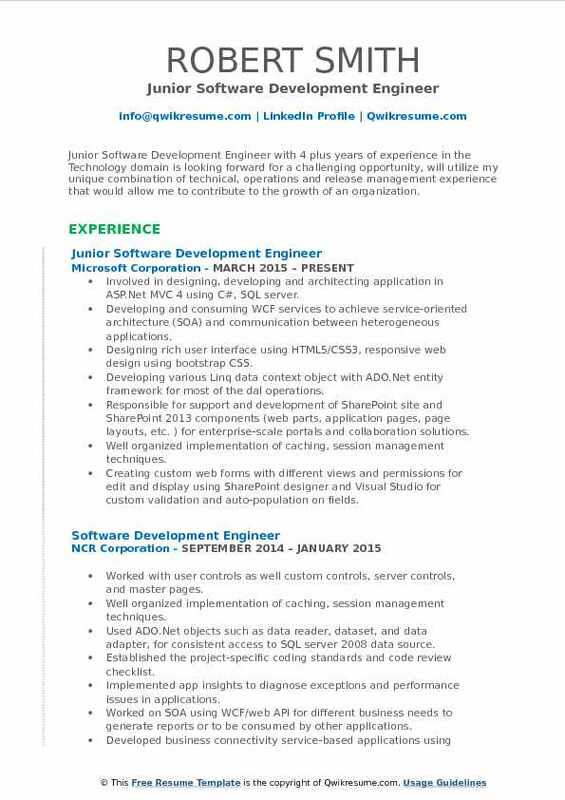 Proficient in developing C++ applications. Strong knowledge of the Object Oriented design aspects. Having experience in Aeronautical and Telecom domain expertise. Extensive knowledge of full lifecycle of software design process including Analysis, Design, Development, Integration Testing and Maintenance. Understanding the requirements completely and involved in writing the high-level design document for various features. Involved in design and implementation of the HAL software to abstract the hardware details on the pluggable interface units. Decoupled the dependency between hardware development and software development, to allow concurrent development on both sides. Designing and developing the device HAL to handle various features of facilities like, (10GE, OCXX, ODUK, OTUK, OCH-NW, and OCH-CL), ODU Encaps, Muxing, ODU switching and alarm propagation. Worked in different layers TL1, MOL, LEM, PEM, and SIL for multiple features along the product lifeline cycle. Developing a design to handle alarm propagation one of the complex feature set of the product line to make it more efficient and easy to debug. Resolving the critical issues in FW-CDs and enhanced many feature sets. Summary : Software Development Engineer II with 12 plus years of experience and with expertise in a variety of software languages, tools, environments, and methodologies Passion for finding innovative ways to efficiently build high-availability, scalable, robust online systems Proven leadership experience and complete commitment to successful and timely delivery Proficient in N-tier application architecture, design, development, testing, and maintenance. Fully owned a claims-based identity data provider (WCF-hosted, C# middle-tier, Ad/LDs and SQL server backend) that was used to secure the manageability platform for Microsoft's online services. Established vision, design, features, and delivery schedule as a project lead to ensure the success of the component despite resource limitations. Designed and implemented v1 of a component that served as the authoritative source for organizational hierarchy used for internal client billing and monitoring. Drove improvements in team-wide development processes to align to monthly sprint release cadence. Fully owned design, implementation, release, and maintenance of internal tools (IIS frontend, C# middle tier, SQL server backend) that reduced operational costs by a factor of 20 and provided the support team with an efficient online diagnostic platform. Responsible for the development and maintenance of 2 web-based applications, as well as various tools, hosted in Azure and based on the Microsoft .Net stack. Recommend options or solutions that meet project needs and desired functionalities. Summary : An accomplished Software Development Engineer IV with 28 years of experience specializing in object-oriented design, with extensive experience in the full cycle of embedded software, Windows and Mac application software, and software for mobile devices including definition, proof of concept, implementation, testing, and maintenance. Currently working in software development maintaining a growing proprietary operating system, a library of embedded product applications, as well as new development projects. Development of wireless sensor serial protocol for proprietary H2S and pressure sensors. Designing and implementing the data logging for embedded Motoroladsp56k applications and in conjunction designed and implemented windows graphical interface application to view data and program the data logger in the embedded DSP products. Designing and implementing the graphical programming and diagnostic toolset windows. Implementing the various asynchronous serial protocols to talk to different purchased sensors,. Implementing the software for the pixel based graphics LCD display and keypad for the primary drive product. Implementing DSP interface to serial lcd color graphic display as a product alternative. Designed iPhone application to communicate to proprietary dsp processor using wifi, and. Developed iPhone application to interface to the proprietary database through php and xml.